Aliens invade Central City on Tuesday night’s crossover episode of “The Flash,” and Barry Allen will be bringing together a team of heroes to fight the Dominators. 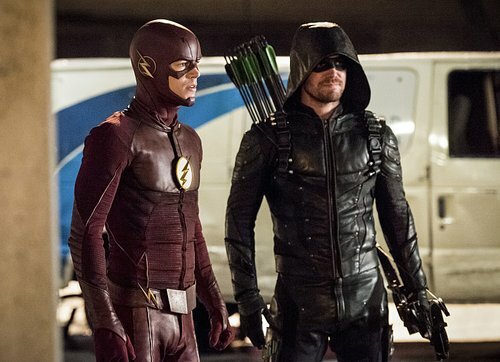 “It was [Greg Berlanti’s] idea to do the Dominators,” “Arrow” and “DC’s Legends of Tomorrow” Executive Producer Marc Guggenheim told reporters after a screening on Monday of the crossover event, addressing how this year’s villains were chosen. “And, I don’t want to speak for Greg, but I think the way it came out … was we all collectively wanted the superheroes to face an external threat. And by external, I don’t mean extraterrestrial, I just mean not a ‘big bad’ from one of the shows, but rather, a threat that came from outside of the shows. The Dominator invasion is the meat of the crossover story, but it won’t make up all of the drama. “Arrow” has some special surprises on the way for viewers, and “The Flash” isn’t hitting pause on the storyline that just saw Wally West (Keiynan Lonsdale) become a new metahuman speedster. “I think that one of the things we always try to do, especially with the crossovers, is not make it feel like all of a sudden we’re in this evergreen world that’s completely disconnected from everything that’s been happening previous,” Kreisberg said. “And … at the end of Episode 307, Wally became a speedster. That’s huge. That’s big news, and to sort of gloss over that and not have anybody react, considering the myriad reactions Joe has had to Barry becoming a speedster and then Iris finding out, felt like we’d be doing a disservice to the people who were watching ‘The Flash’ and enjoying it,” the producer added. The first two scenes of the four-show crossover took place in Monday night’s “Supergirl,” when Kara Danvers’ family had their Thanksgiving dinner interrupted by a Cisco-made breach that didn’t quite make a full connection. And, at the end of the “Supergirl” episode, Barry and Cisco finally made it through to her Earth, and recruited Kara. Monday’s “Supergirl” was the show’s final episode of 2016 (it returns next year), the major factor in why there was just a touch of the crossover in National City. The Flash” airs Tuesday at 8/7c. The crossover continues on Wednesday’s “Arrow” at 8/7c and Thursday’s “DC’s Legends of Tomorrow,” also at 8/7c on The CW.